SPCR • View topic - HDD project.. "Bird-House" Some new mods. HDD project.. "Bird-House" Some new mods. Post subject: HDD project.. "Bird-House" Some new mods. This thread is getting pretty long, so I thought I'd summarize the whole project in this first post. This "bird-house" device is a very versitile way to de-couple, noise-dampen, and cool your hard drives with one easily-constructed mod. As side benefits, it can also hold a rather large intake air-filter, mounts any size intake fan 6" further back in the case (which reduces noise), and can be angled to blow cooling airflow directly at the under-side of a video card..from only a few inches away. It also could hold up to about three drives, depending on your case size. Of course with more drives in the bird-house, the drive temps will rise, or you will have to increase the fan speed. The first thing to do if you want to build one......measure your available space carefully, very carefully. Leave enough clearance so the drive connector cables won't touch the case. If the cables touch the case panel, noise will also be transferred into the case....not good. Also....be certain the fan end of the bird-house will clear any motherboard cables/connections. This whole setup can be easily modified to suit your own needs. Sizes, materials....anything goes. 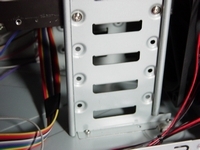 The end result is a quiet drive mounting method, which does not interfere with your ability to cool the drives. A number of people have posted pictures of their own versions of the "bird-house mod"......check them out. Last edited by Bluefront on Mon Jul 02, 2007 5:31 pm, edited 9 times in total. Evasive, not all the information, promises and teasing, all in one post. I'm relatively new to your forums and haven't posted much, but I've been busy with designing/building a quieter computer enclosure for my wife's computer system, using many of the ideas posted here in the SPCR forums; especially your air-intake duct box innovation, Bluefront. I''m nearly done with that part of the project and will soon be looking at ways to quietly mount my wife's hard-drives--so hurry with the posts and pics!! and I say to myself...."This is dumb....a hard drive cage that holds five drives (who needs that many? ), and lets them sit there, vibrating, and over-heating. Somebody got paid to design this. You can do better." Oh wait. Did I just hear somebody say "quietly mount my wife"? A little slip of the...well, never mind. Here it is, photos 10-20. This is my "bird-house" HD mod. And actually if you can build a small bird-house, you could duplicate this project. That's 3/16" oak plywood (1/4" would have been easier). The foam insert is Safety Mat foam from Sams Club. The hard drives can be removed from the right side, or just remove the filter and and pull the foam/HD insert out of the box. The drives are held snugly by the foam and completely de-coupled from the box. The filter is the same type I used in my "cookie jar" computer.....a Hamilton Beach True Air filter #4711, out of a home air filtration unit (Target $10). I'm going to secure this unit to the computer by just wedging it in with a foam block on top, wedged against the 5.25" bays. It could be attached different ways, but with this case, that method is easy. Foam-decoupled drives (up to three could fit). Easily removed, with the cables hidden. An excellent air filter system. An intake fan of any size, mounted far enough inside the computer to be almost inaudable, even at moderate fan speeds. Ducted cooling of the drives. Direct airflow on the video card, or however you wanted it. A modular setup that comes right out. No exotic materials, you could find everything at Home Depot (maybe not the filter). Depending on the location of the intake on your case, the setup can easily be modified to your own specifications. I'll just enlarge the 120mm hole on my case to a large square hole, matching the size/location of the filter. Since this computer is not finished yet I have no real temp specs....but I expect HD temps around 35C. Till now I have avoided front intakes....but I think the dBox case I'm using here will be very quiet. Any questions, just ask. Nice one, Bluefront - and always the trademark filtration system . Very nifty though by the looks of it. I've been trying to think of an effective, yet easy to build HDD cooling/quieting system, but nothing I've thought of even comes close to this! I'd really be curious as to how this puppy works under actual useage, especially temps wise, but I'm sure it'll be fine. The built in AGP card cooling is icing on the cake. Bluefront, I really want to try this out, it looks like the perfect solution to my problem; howeverf, I cannot seem to find safetymat ANYWHERE where I live, I've checked local fabric stores, walmart, kmart, home depot, etc. and it seems not to exist so I was wondering if you had any other Ideas for holding the drives in place? I know you can find SafetyMat foam at my Home Depot....in the flooring dept. Also at Sams, at Lowes....You usually see it in a package of four (Blue, yellow, red, green). The gray stuff I'm using here came from Sams. I suppose you could mount the drives inside the bird-house any number of ways. But just being wedged in the foam makes removal of each drive very easy from the right side without removing anything but the case panel. Also that 1/2" foam dampens the whole enclosure....plus it's easy to cut with a sharp blade, and the square pattern on the one side makes drawing straight cut lines a snap. I don't know of anything similar. Maybe a heavy piece of carpet might work. I have seen similar pieces of foam sold as knee-rest pads in a garden supply store. The really nice part of using Safety Mat foam is that it wedges into places, and stands up on it's own......no adhesive was used in this bird-house mod. yeah i've looked in the flooring department and like everywhere else in the store, it was nowhere to be found. I don't have a sams or lowes near me so i think im gonna have to come up with a diff way to secure the drive. If you don't have a local Sams Club you can order stuff from thier online store. Very nice! I think this is the best you've done yet. The true mark of genius is utter simplicity. This one meets that criteria. Now let's get it in the main site in the storage area! I've looked all over online for this stuff and it seems like it's nowhere to be found... anyone possibly have any links? (it's not sold locally where I live). I just requested a free sample. Guess I'm a sucker. I did make sure I gave them an email adress I wouldn't mind deleting in the future. Thanks for the info! Right now I'm just using realitivily thick old moust pads from work (InfoTech). Hey, it's free! Well the Bird-house is finished, ready to be used in this new computer(when it's completed). I covered the outside with 2mm foam, and added two push holes in the left side.....makes removal of the drives easier. MikeC is going to attempt to build his own version of this device....so he says. He thinks a softer foam may work better. It might. If you glued soft foam to the panels the end result would be the same....but you would have to remove the drives from the right and couldn't remove the foam inserts as an assy. Look for an article on his project coming soon? FWIW....picture #23 shows the hole leading into the front case bezel (air comes in here) The birdhouse sits here with the filter pushed up against the hole. That's the Ahanix fan control panel in the photo. I know it doesn't look like it, but there's plenty of airflow here. Picture #24 shows the same hole from the front with the birdhouse installed. Well, Bluefront, you've helped make my wallet about 43 dollars lighter; I just ordered 4 2x2 foot mats from www.wondermat.com so I can try this mod out for myself . Just a few questions though, how secure are the drives in the enclosure? I ask becuase while I do not attend LAN parties often if at all, next year I will be attending college and will have to transport my computer back and forth for moving in, winter break, spring break, and moving out for summer break. I'm sure I can find a way to secure the cage in my case, but do you think I would be safe if I transported the birdcage seperately from my case? Like I would carry the PC in in two "halves" if you will, my PC, and then the birdcage (with the HD's left in it). What do you think? If I did this, any precautions I should take? Or do you think I'd just be better off wedging the birdcage in for transportation. Any and all ideas welcome. Yipes...$43. Too bad you couldn't find the stuff locally. How snugly the drives fit in the foam depends on the size of the hole you cut. If make it too tight, the drives won't just slip out the right side holes. For total security don't cut the right access holes in the wood panels at all. (Of course you'd need small holes for the wires) Just install the foam panels and drives from the rear. Notice the felt inserts on the one panel....keeps the bare edge of the drive from touching the wood panel. The hardest part of this project was measurement....making sure everything will fit together when finished. I know that sounds easy....but it's not. And working with thin wood panels is not easy. It might be better to clamp and glue the panels, rather than use screws. I have the cage wedged into the computer using more safetymat foam.....but I'm not going to be moving it much. You might want to design a more secure method.I'll put up another picture of how it looks now that it's finished, and the foam wedge method. Yeah I believe I have an idea for securing it in my case, but we'll see once I get the foam how it works out. Thanks! I was hoping your idea would be something like this. I will be working on my own system soon and will definitely be incorporating a version of this mod. It is simple, does not require a lot of expensive materials and you don't have to have a lot of woodworking/machine skills to carry it off. Very nifty indeed!!! I just hope I can find that Safety Mat stuff at my own home depot. A nifty, simple, and I bet very effective solution. FWIW....There are an endless number of possible variations to this mod. You could construct the whole thing out of heavy cardboard and duct tape. That thin foam I covered the outside with, came from a craft store, as did the pieces of felt. They come in sheets mabe 12"x9".....about $1 ea. they have a sticky back and attach easily. I like that safetymat foam because of it's dampening ability, but you could substitute other stuff. Carpet padding foam might work, maybe a heavy floormat. The idea is to use something heavy enough to dampen the sides without taking up too much airflow area. You could use a softer piece of foam around the drive itself at the point that rests on the safetymat....further dampening the drives. MikeC thinks safetymat foam is too stiff to work well....but I've used it before with good results. If you notice the floor of the computer in the photos is covered with a piece of safetymat. So is the inner top of the case....from the front bezel back to the PSU. Very useful stuff. That's a Yate Loon 120mm in the photos. It's the quietest 120 I've ever heard, and can run as low as 2.8v.....which is the lowest speed on the dBox fan controller. At 11.5v it sounds like an Evercool. Will it start at 2.8v? Because I've got a FSP350-60PN and I believe it has got a Yate loon 120m fan I will rip it out and use my SS400W ducted to the right side, but I use a Zalman MFC1 fan controller and I will probably buy a fan mate in between so I can get as low as ~2.5v(?) but it doesn't give it the 12v push that the PSU fan controller does if I'm not mistaken. Also.. I'm probably builing myself one of these babies! I doubt if that fan will actually start at 2.8v. The dBox controller it's hooked up to, always starts at 11.5v, then drops down to 4.5v. At that point you can lower the voltage manually to 2.8. Great, thanks! Well I'll have to run it at as low as possible I guess..
Where could i get one of those yate loon fans at? I want to take out the drive cage of the BQE and replace it with something more HDD noise friendly, i think your birdbox idea rocks, i would have the filter and fan of the BQE since since the fan and filter on in the front, and then i would have a super filter of the box. I already have all the extra holes taped up.